Black and White Channel Islands Surfboard is an all around, high performance shortboard designed for down the line speed and easy rail-to-rail transitions, the Black & White is based on a favorite hand shape Britt Merrick made Dane Reynolds for Santa Barbara area point breaks. Dane related its feel to a good MBM. The Black & White has a fairly low entry rocker, a staged flat-ish section between the feet, and an accelerated kick out the tail. A single concave runs the length of the board, is deepest near the front fins and shallows into a hint of vee exiting the tail block. A flat deck design, the Black & White offers improved flex characteristics, a solid under-your-feet feel, and full rails. The board should be ridden about your same height to 2″ longer than you are tall. Because of the flat deck ride the board 1/8” thinner than your normal shortboard to keep the same general volume. The Black & White is suitable for most surfers in most type es of surf where a shortboard is appropriate. Oversized Item Excluded From Free Shipping! 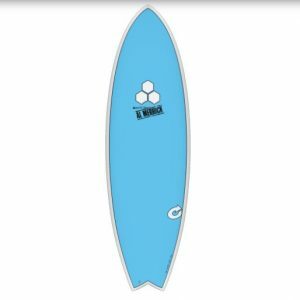 Call The Shop to Order a Custom CI Surfboard Today! Copyright 2019 safaritownsurf.com All Rights Reserved.